Brian’s Note – I just wanted to say that this list is only my opinion. I’d also like to point out that the 1970’s was, in my opinion the best decade for American Film in history and this list was very hard to make and compile. Kubrick’s haunting and gorgeously shot (some feel the most beautiful cinematography ever and it would be hard to disagree) costume epic about one man’s quest to climb the social ladder no matter the cost. The emphasis on hostility hidden behind the manners of the day is so well conveyed by Kubrick that it will stay with you for days. Stallone wrote and starred in this masterpiece that set into motion a chain of sequels, parodies, and knock offs that did their best to diminish the power of the original and yet it still endures. The greatest sports films are more about the characters than they are about the actual sporting event. It would be easy to label this as a boxing movie particularly because its sequels are exactly that. But, it isn’t. It’s a love story about two imperfect souls who couldn’t be more perfect together. The grand-daddy of all the big budget Sci-Fi films to follow that can’t hold a candle to this movie. There’s not many people on this planet that haven’t seen this movie so I won’t waste my time telling you about it. I’ll just throw in a quick factoid. This movie was made for 6 million dollars. How in the hell did they do that when there’s films today with 20 times that budget don’t seem as grand and epic? Coppola’s version of Joseph Conrad’s Hearts of Darkness set during Vietnam is a gut shot of a film. It doesn’t try to document the war like Oliver Stone did with Platoon but to create an artistic expression of war as madness and despair. The further Martin Sheen travels down the river, the worse his psyche, and ours along with him, get lost. The best part is that this movie only gets better with age. This swept all five major Academy Awards (Best Picture, Actress, Actor, Director, and Screenplay) in 1975. And, for once, they actually got it right. The greatest trait of this film is the was director Milos Forman mixes comedy with drama. You laugh with these characters and get attached to them. It makes it all that more effective when things turn tragic. It also contains the greatest performance of Jack Nicholson’s career. Another Kubrick masterpiece that asks the question: “Can you cure a thrill criminal?” Malcolm MacDowell is utterly brilliant as Alex, a psychopath who almost approaches likeability if it weren’t for his obsession with hurting others. Kubrick wisely shoots the film entirely from his perspective and you see the world as he sees it: a playground of animalistic urges. The greatest popcorn movie of all time and the first summer blockbuster. I’ve read the Peter Benchley novel and quite frankly, it isn’t very good. The film improves every aspect of the story and Spielberg’s camerawork is utterly flawless. He would go on to make many hit films but this still remains his best. A film about love, sacrifice, and faith disguised as a horror movie. If all this film was about was a possessed girl puking pea soup on a priest, it would not be the revered classic it is today. The greater proof to my theory on that is the litany of bad sequels, ripoffs, and derivative crap that has come over the year. Not one of them has been any good. Scorsese’s first masterpiece, like Apocalypse Now, is a descent into madness. Setting the story in NYC makes Travis’s tale of loneliness all the more profound. He’s surrounded by millions and yet not one person there even remotely understands him. The story also works because while he’s hailed as a hero near the end, his violent repression was going to come out one way or the other. If it hadn’t been against a group of pimps and lowlifes, it would have come against a U.S. Senator who could have become president. De Niro and Scorsese have never been better. I’m going to cheat and name both the first and second Godfather because they are really two halves of an entire story. Once you actually get to the end of the second film you realize that it’s how a Father and son could be so alike and yet so different. Vito is a man of business but he still looks out for and cares people. Michael on the other hand is also all business but will cut the throats of even those closest to him. Its poetry, acting, and wonderful cinematography is why I chose these as the best films of the 1970’s. Sound off below, gang. Let us know your favorite films of the 1970’s! Hope you enjoyed the post and thanks once again to Brian for a fantastic piece. Well, you left ten great films off! Oh, and your Top Ten is perfect! THAT is what makes the 70’s such an amazing decade for film – so many classics! I totally agree that “Godfather I + II is a singular film – and there are so many others I love such as “Network” and “Carrie” – plus cult gems like “Phantom Of The Paradise” and “The Last of Sheila”…great post! I love Network! And Carrie is great 70’s cinema. I loved De Palma’s films from the 70’s. I agree, that decade was a stunning example of both cult, experimental and ground-breaking works of cinematic art. Glad you liked Brian’s list, John and thanks for checking in. I appreciate it! Great top 10 films of the 70’s, I really like the Godfather 1 & 2 as well, brilliant films! Think I would have placed Star Wars higher, prob no 2 or 3, and Jaws is another favorite of mine, and the Exorcist as well. Rocky is another classic. Great post! 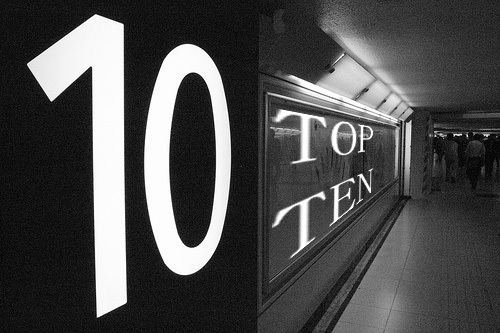 Always enjoy reading these top 10 films lists! I would have placed those films higher as well but they are at least still on the list, lol. I am very glad you like these lists, Paul. I have a few lined up that I think you will like. Stay tuned! I appreciate you checking out Brian’s list! Thanks for stopping in, man! Real solid list, Brian. I had the 70’s as the second best behind the 90’s, but I’ll say they’re very close, and you didn’t even list any of the classic comedies that really filled out the decade (save Monty Python in your honorable mentions). I’ve actually never heard of Barry Lyndon so I’ll be adding that to my watch list. Thanks! Barry Lyndon is an overlooked entry from Kubrick but still a great watch and an interesting film. I don’t think I would place it in my own top 10 list but it may get an honorable mention. I haven’t watched a Monty Python movie in ages! Need to re-visit them asap, lol. Great list! I agree that the 1970s was one of the best (if not THE best) decade for films in the US, so narrowing down the list must have been challenging. The impact of the films has such a wide range: big blockbusters like Star Wars and Jaws and even small independent features like The Texas Chainsaw Massacre had massive effects on film making and films in general. On a side note: I am in the minority.. I actually prefer (by a small margin) the first Godfather. Still love the second though! I also prefer the first film over Part II by a very small margin like yourself. It had such a mystical and moody quality that I really loved. The 70’s was a stunning time for film and how we were introduced to some iconic directors of that era like Lucas, Spielberg, Hooper, Carpenter and Scorsese to name a few. I am drafting a top 10 myself but I feel that Brian’s list is tops! The 1970s were a great time in the progression of film. Especially the more experimental stuff, so great job cutting the list down to 10! Glad you liked Brian’s list, Maurice. I have a top 10 in mind myself but I think Brian’s is tops, so I may wait a bit, lol. Vic, although I can’t agree with all the choices (I couldn’t leave ALIEN out of the top ten), I must say you created a solid list, honorable mentions and all. Regardless, your choices are hard to argue. Yeah, I didnt envy Brian this job of narrowing the choices to just 10. None the less, he stepped up. Thanks for checking in, Bill. Much appreciated man!